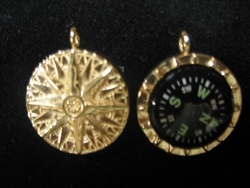 The photo at top of the page shows both sides of the pendant. The inset photo on left shows the detail of the top of the compass rose pendant. 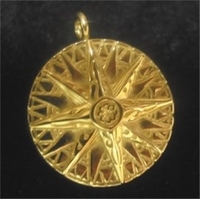 This 14K gold compass pendant is about the size of a quarter in diameter. 14K Gram Weight: 16.3 Grams This is a solid 14K Gold Heirloom piece.